Maybe I'm an emotional lightweight. The larger fiber festivals pull me back and forth, up and down. I was exhausted, wrung out, at the end of each day. So many mini-decisions, so many temptations to balance and weigh. Two vendors suggested that Rhinebeck has become Marylandized. The numbers of people trying to cram into small booths, into crowded narrow passages, carrying stuffed large bags, puffy fleeces...aren't you nodding your head by now? It was a good festival. Each one is different in obvious ways: vendors, size, people. Each one has become different in more subtle ways. Our fiber community has grown. There are more bloggers. 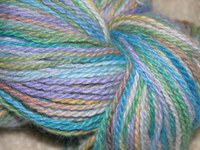 Ravelry provides an overlap between bloggers and nonbloggers. It's a HUGE group now. The fiber festivals absorb all that fiberlust and passion. 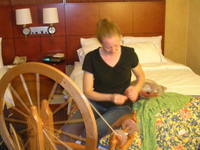 However, the venues have not expanded, and the hand-dyers can only dye so much yarn and roving for each festival. It's a recipe for craziness. Communities (like cities) expand, fragment into suburbs, groups coagulate by interests, age, proximity, affinity. All groups follow the same dynamics, which is why Rhinebeck feels so fragmented to me now. I had a wonderful weekend. 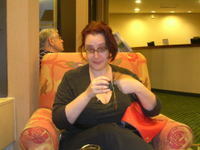 Seeing Our People was the best part, as echoed by other knitbloggers. I bought sparingly. The linkfest has been done by now by others. I bought small amounts of roving and top from Carolina Homespun, Frelsi Farms, Weston Hill Farms, Persimmon Tree Farms, and Spirit Trails. This will become house and slipper socks. A booth in Barn A, across the aisle and down from Skaska, seduced with angora 80%, merino 20% softness. This will become mittlets. The last skein to show you is my Rhinebeck coup. It is Yarn Art. It is Yarn Seduction. Those Briar Rose folks really know how to dye their merino 50%, tencel 50%. I initially thought it would be a good Clapotis yarn, but I love it to distraction, and may find more magnificent paths for it. Nothing my camera did to it could express its ethereal beauty. 1000 yards of laceweight s3x. I came home to a reglued household (that which had been broken was now fixed). There were no pizza boxes in evidence. I did find a dead soldier in the form of an empty wine bottle. One must not begrudge those whom one has left behind. And I did not tell him of the magnificence of the pomegranite martini. I did manage to knit with abandon, with a touch of recklessness added to the mix. No one told me HOW LONG each row of 300 stitches on a lengthwise scarf would take. Great to see you this weekend! It was wonderful as always to see you this weekend! The Briar Rose yarns are so beautiful! A Long. Freaking. Time. is the answer to that question. I'm so glad I got to hug you. I wish that we had more time to see each other! I do so agree with you on Briar Rose. Love them. Absolutely love them. And, of course, I love the seeing people. It's what makes it worthwhile. Oh, I missed you guys! (Not Rhinebeck, though!) A stomach bug Saturday night put an end to my thoughts of trekking up on Sunday. Maybe next year....if they get some good classes and I can find someone to keep me company! It was so much fun! I'm watching the Red Sox now and it's just not the same without you. I see no other way to verify this "Marylandized" theory than to simply go to Maryland and see for myself. If I go to Boston first, can we stop at Webs on the way? Ha! I'm so glad I witnessed your Rhinebeck coup. :-) Makes up for all the other stuff I missed... that festival is just too big, I think. I missed so much... and so many people I wanted to see. 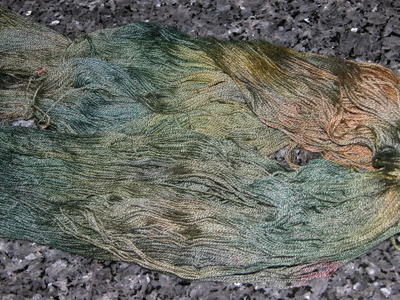 I'm coveting the Weston Hill Farms roving I got. And I can't begin to tell you how fun it was to finally meet you! How did I miss Briar Rose?? 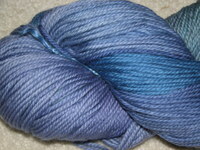 That skein is just gorgeous! And, again, I'm sorry we didn't manage to meet this year!! Oh yeah, I saw that Briar Rose stuff. Magic, eh? I know what you mean about the craziness. At one point on Sat afternoon I suddenly realized that I had fought my way into one too many booths. I hope that Rhinebeck doesn't drown from its own popularity. I went back to Weston Hill Farms on Sunday, but, alas, too late. Next year. What, no cashmere? ;o) You have some beautiful acquisitions! So glad I could see you for a few. Those of us who can't do Rhinebeck sit at home and order on line. It's not the same. It's good that the community has grown, strength in numbers and all that, even if does have some disadvantages. I'm sorry I missed you yesterday. (I had Car Issues, all better now.) I must fondle that yarn. As Carole said, wish I could have shared another bottle of most excellent Chateau Bequette with you. Fragmented is a good word. I had a wonderful time this weekend and I think Rhinebeck is such a great experience. But I think there's something to be said for the smaller festivals too, like Cummington and CT. Especially the way we do them: with food, and shopping, and lots of time to sit around and laugh because we've already shopped all the vendors. What a great way to put it! Rhinebeck DEFINITELY felt fragmented this time around. I'm becoming more and more nostalgic for three years - in my opinion - the perfect festival. I loved seeing you though. A Laurie hug and that rub on the back is always a highlight for me. ALWAYS! Thank you! You did a very fine job of shopping and your yarns are truly elegant and unique. So happy I saw you for a real while on Sunday. I was slightly less restrained. Cough. It was fragmented, but still excellent. Excellent to hug you. i'm guessing the laceweight was your most excited yarn moment of the weekend? it's absolutely beautiful. so great to have met you and enjoyed the red sox game with you and the crew. cheers! Part of what has Marylandized Rhinebeck is that they're selling it as a family fun event and letting all those muggles in to crowd our spaces! I saw one greasy, semi-toothless guy (definitely a muggle) go all nuts at a ballwinder. Oy. Rhinebeck was very different this year- something seemed out of place though I had a wonderful time. Still trying to sort it out on re-entry. Yes, it was fragmented and whirlwindish too. Time seemed to evaporate into thin air. Wishing I had more time to visit. Sounds pretty wonderful, though I completely get what you mean about feeling wrung out. Its prob. one of the reasons I don't break my back to get to the bigger events, as wonderful as a time I know I'll have I just get so drained, even after smallish ones. Can't wait to see what your reckless abandon produced. Yeah. Exactly. Me too. Here it is, the Saturday after Rhinebeck, and I still haven't adjusted to real life again. I just want to play with fiber forever. And fiber friends, too! Thankfully, power-shopping was not my desire, because if I'd had to fight those booth crowds, I might have gone psycho! That Briar Rose yarn is so, so gorgeous. Mmmmm.